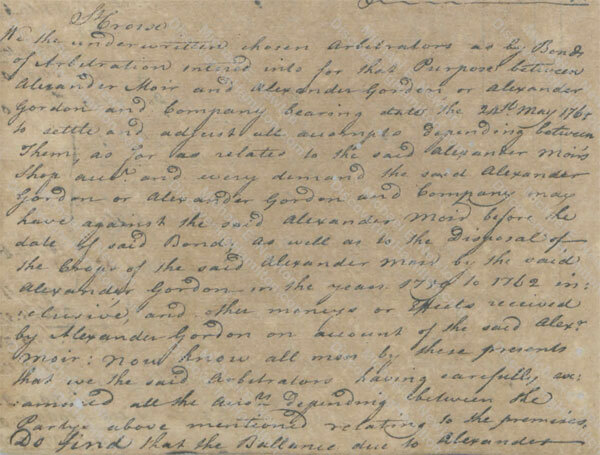 Only a few records of James Hamilton, Alexander Hamilton’s father, are known to exist. 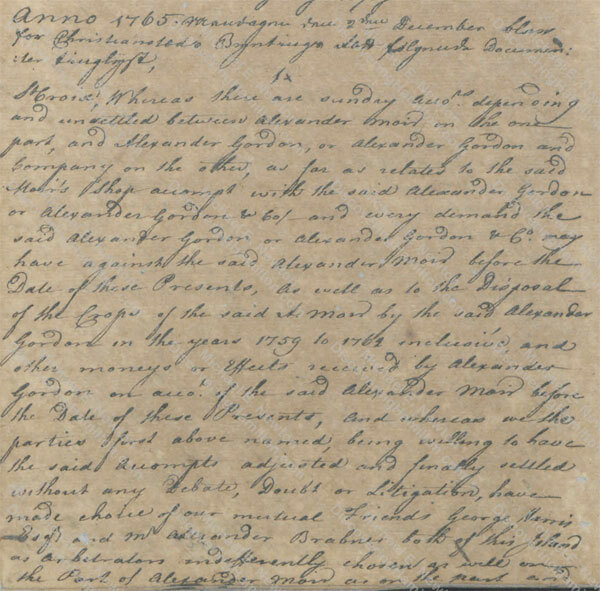 I have previously written about James Hamilton’s birth, his early business career and move to St. Kitts, and his visit to or residence on St. Eustatius (see parts 1, 2, and 3). 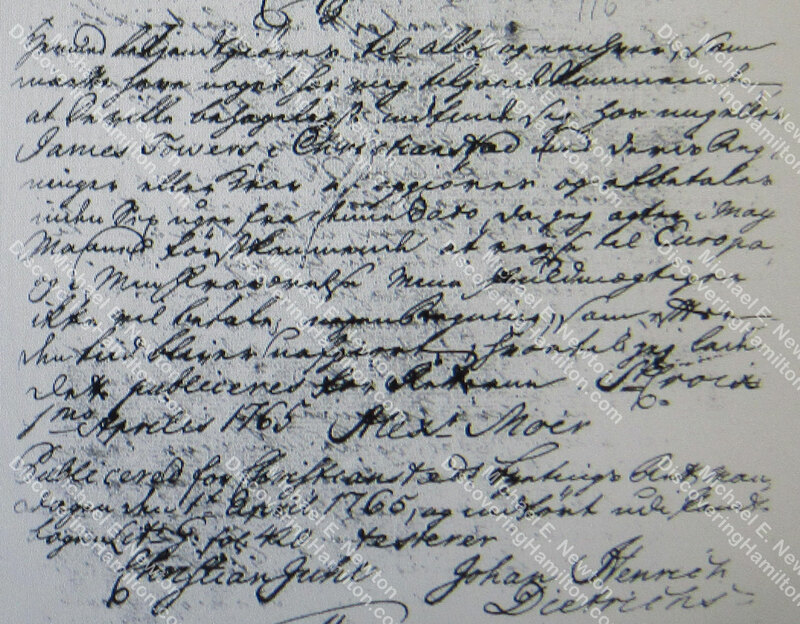 In addition to the new findings included in those blog posts, I have also discovered a number of new records regarding James Hamilton on St. Croix, Bequia, and St. Vincent. 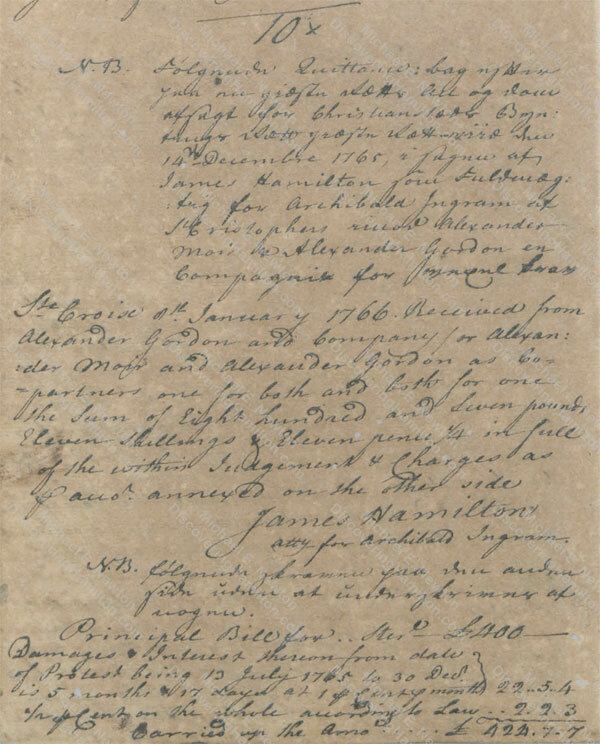 Rather than share these new discoveries by themselves, a chimerical task without providing the proper context, I will continue to tell James Hamilton’s story, as best I can, in chronological order, incorporating the new discoveries into the general story of his life. As a result, the previous blog posts about James Hamilton and those to follow will provide the most up-to-date and comprehensive narrative of James Hamilton’s life. On April 1, 1765, Alexander Moir of St. Croix announced his intention to leave for Europe during the month of May and asked his creditors to submit their claims against him. Alexander Moir was a partner with Alexander Gordon on commercial ventures. At this time, Moir and Gordon were dissolving their partnership and in the midst of arbitration. 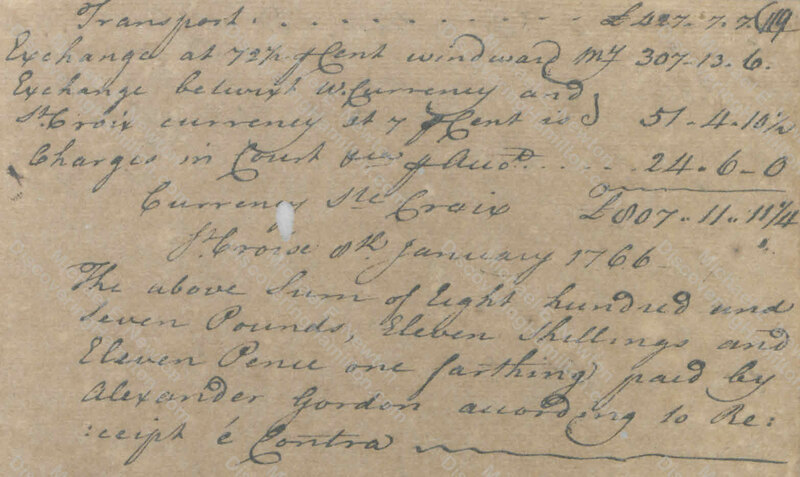 Archibald Ingram of St. Kitts sent James Hamilton to St. Croix to collect a debt from Moir & Gordon, as will be seen in the next section. 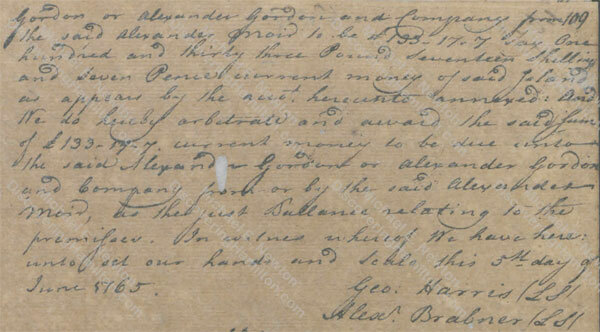 It is not clear when James Hamilton came to St. Croix, but one assumes it was in April 1765 because Alexander Moir announced on April 1 that he planned to leave during the month of May. If Ingram and Hamilton wanted to submit their claim before Moir departed, Hamilton would have had to arrive in April to be safe. 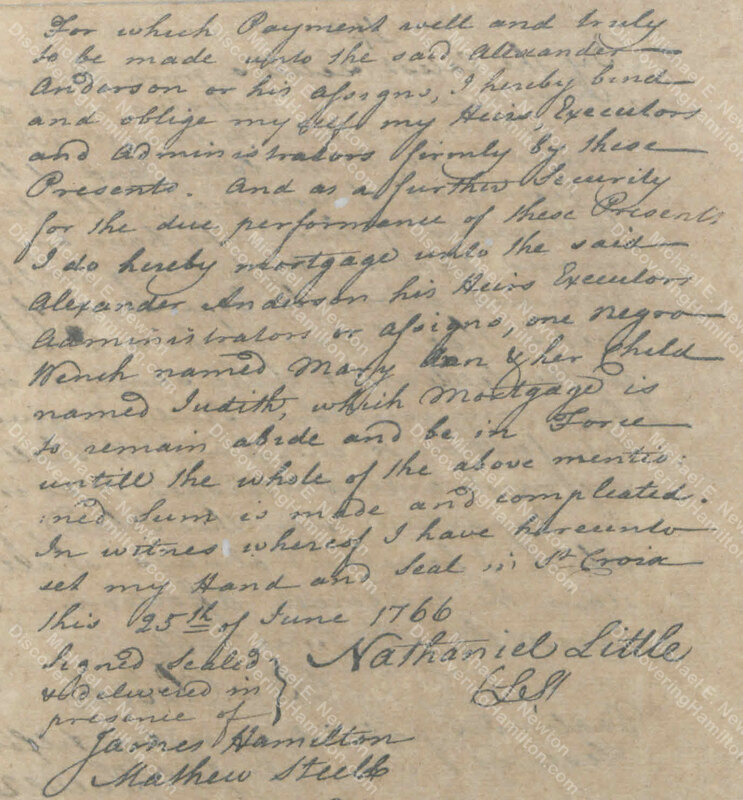 It is also unclear whether James Hamilton’s family—Rachel Faucett, James Hamilton Jr., and Alexander Hamilton—came with him to the island or if they came after James Hamilton realized that he would be some time on St. Croix collecting this debt. Moir & Gordon refused to pay Archibald Ingram’s claim against them. On July 13, 1765, James Hamilton, on behalf of Archibald Ingram of St. Kitts, filed a legal “protest” against Moir & Gordon to collect the “bill” of £400 sterling due to Ingram. Thus, James Hamilton was on St. Croix on January 8, 1766. But he does not appear in St. Croix’s matrikel (property and census records) for 1765, which for Christiansted was compiled between January 13 and January 23, 1766, and for the plantations between December 16 and 23, 1765. Why would Rachel appear in the matrikel without her husband if he was still on St. Croix? 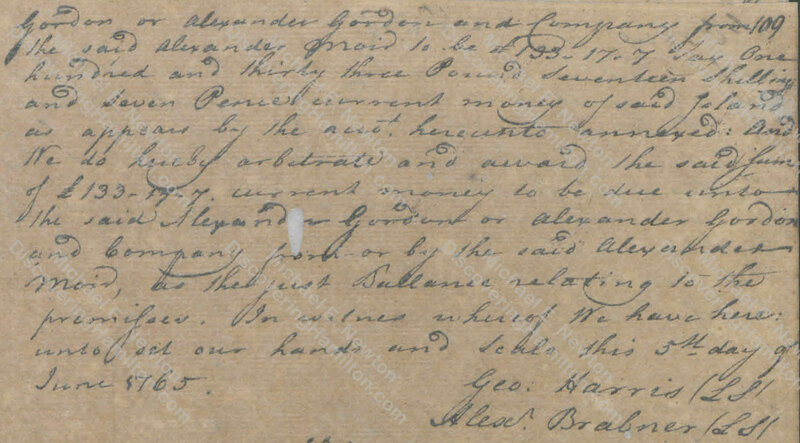 And if James Hamilton returned to St. Kitts to give Archibald Ingram his money, why did Rachel and the children stay behind? There is much speculation regarding this phenomenon, but this is not the place to discuss it. 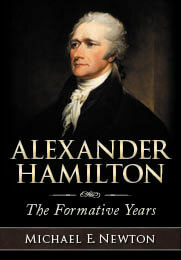 I evaluated the various theories and possibilities in Alexander Hamilton: The Formative Years and refer you to that analysis. On June 25, 1766, James Hamilton acted as a witness to a mortgage document and signed his name to it. 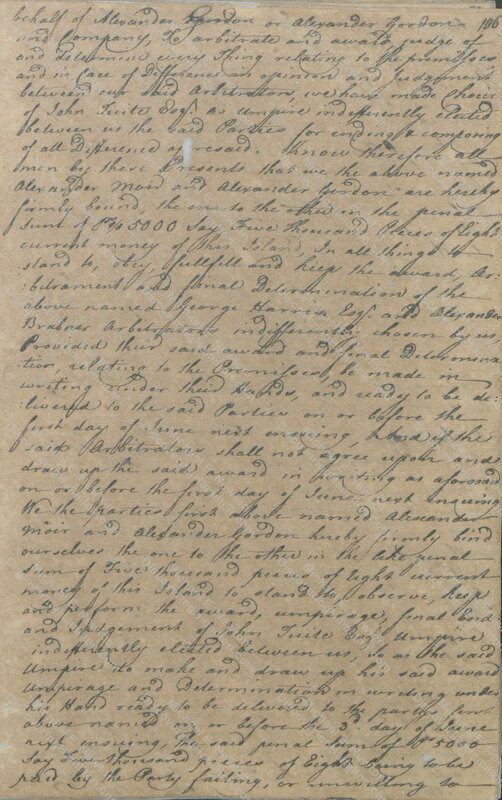 The original document is lost. All that remains is a copy found in the official registers. Unfortunately, as a copy, James Hamilton’s signature on this document is also a copy and therefore cannot be compared to known James Hamilton Sr. signatures. Accordingly, it is impossible to know whether this was James Hamilton Sr., James Hamilton Jr., or a different James Hamilton. For example, in addition to James Hamilton Sr. and Jr., there was another James Hamilton on St. Croix around this time period. Whether this other James Hamilton was a resident or a visitor is not known, but he is not found in any of the matrikels. This James Hamilton, “aged 37,” was buried in the churchyard of St. John’s Anglican Church, Christiansted, St. Croix, on July 13, 1769. If the above legal witness was James Hamilton Sr., father of Alexander Hamilton, it would suggest that either James Hamilton stayed on St. Croix after collecting the debt or that he returned to visit the island, perhaps related to his work for Archibald Ingram or to visit his wife and sons. 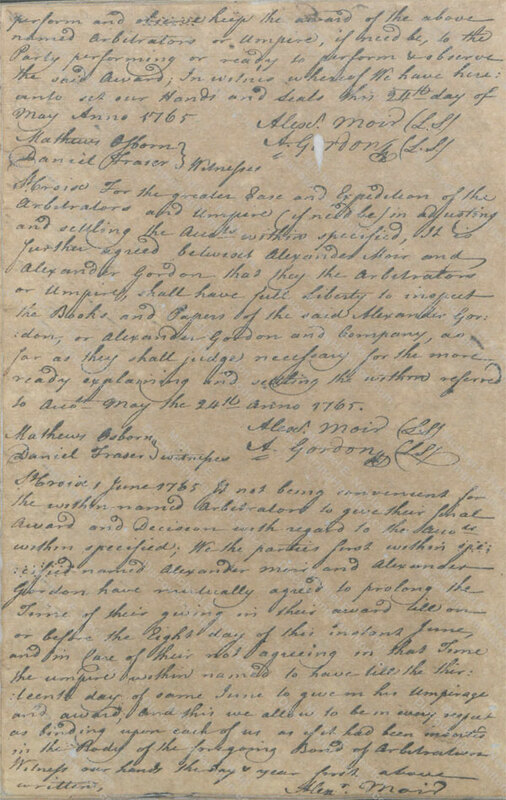 On the other hand, if the above legal witness was not James Hamilton Sr., it suggests that James Hamilton left right after collecting the debt. In the end, it is impossible to know whether this was our James Hamilton or another of the same name and whether our James Hamilton stayed on St. Croix or returned immediately to St. Kitts. 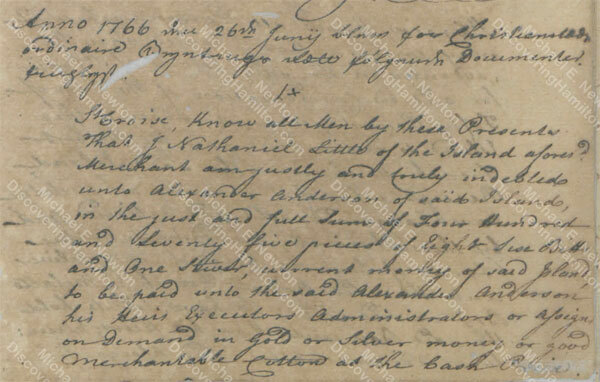 Either way, James Hamilton Sr. must have left St. Croix by February 1768 because he certainly was not on the island when Rachel died and his children were taken in by the Lyttons. © Posted on June 11, 2018, by Michael E. Newton. Please cite this blog post when writing about these new discoveries.